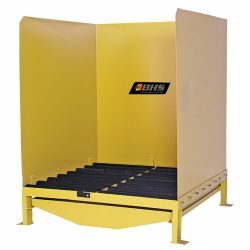 The BHS Roller Wash Station (RWS) provides a convenient and contained location to wash electrolyte from forklift batteries. Leaks, spills, and boil-overs can leave corrosive residue on cases or terminals as batteries are used, watered, and charged. Regularly cleaning this electrolyte from the battery will increase its life and performance. The Roller Wash Station has spark-proof, poly-sleeved rollers to easily slide batteries into the contained area. A removable drain tray collects waste water and can connect to a BHS Recirculation/Neutralization System (RNS). Three 48-inch walls prevent overspray from reaching the warehouse floor while still permitting staff easy access to the battery during washing. The body of the wash station is powder coated to resist corrosion and the poly-sleeved rollers are also anti-corrosive. Optional fork pockets can be added to the station to add mobility. BHS Roller Wash Stations help warehouse staff safely maintain forklift batteries for added life and better performance. Contact our sales team at +1 314 423 2075 to find out more about Roller Wash Stations or other Battery Wash Equipment from BHS.